To offer the eyewear market, and all the companies that perform laser processing on small, high-quality batches, a machine that is precise, reliable, "light", and lowers operating costs. Applyca has created CUBE, an island for fibre laser cutting with modular architecture and a compact structure (2,500 mm on each side), equipped with FANUC laser source and control. CUBE is a machine suitable for different applications and needs, which is aimed at a target that is attentive to maintaining a high level of competitiveness, without requiring prohibitive investments, or occupying vital space in the workshop. The presence of FANUC solutions is a guarantee of reliability and also offers Applyca new business opportunities overseas. FANUC Fiber Laser with 2-D and 3-D cutting technology delivers fast, superior results and precision edges on thin metal sheet. This model offers great advantages thanks to high repeatability and considerable working load, for assembly applications, transfer of parts, material removal, integrated servicing, and dispensing. With a weight of only 25 kg, the LR Mate 200iD robot is easy to integrate and, thanks to multiple mounting options, offers enormous positioning versatility, including operation in extremely tight spaces. Strategically positioned in the heart of the industrial North East, Applyca is a system integrator able to provide turnkey application software and products for the most diverse application needs, thanks to field experience spanning over 25 years. Applyca is also a company that knows how to stand out from its competitors, in fact, at the EMO 2015 fair, it brought "Rob the pianist", two LR Mate 200iD robots with aluminium "hands" which were programmed to play songs. One of the songs played was the Italian National Anthem, Mameli's Hymn. "Programming a robot is a common skill for all integrators, but there is always something that makes the difference", Explains Alfonso Sciarrabone, Sales Manager of Applyca. "In our case, it is solid experience combined with a high capacity for personalisation". Applyca has recently developed CUBE, a high precision fibre laser cutting machine that stands at the top of its category for accuracy, efficiency, reliability, and low running costs. “The fibre laser is very flexible, manageable, and can efficiently perform different types of processing such as cutting, marking, and offering a completeness and intensity that is lacking in CO2 lasers”. 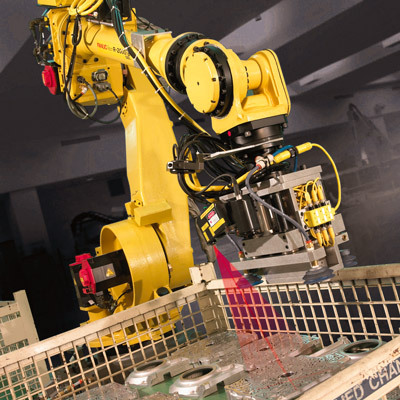 Equipped with 30i-LB series numerical control and 2 kW FANUC laser system, CUBE can also be completed by a FANUC R-2000iC/ 125L integrated servicing robot. Presented for the first time at SamuMetal 2018, CUBE is the most unique fibre laser cutting machine of its kind. It is of a small size, just 2500 x 2500 x 2500 mm. In the current laser landscape dominated by very large and cumbersome machines, CUBE aims at that part of the market that would like to perform laser processing but do not have much space in the workshop, or particularly complex requirements, making it sensitive to the investment required. In addition, its size allows it to be transported in standard 20 or 40 foot containers, an admirable quality for shipping management that also opens up new opportunities and perspectives for Applyca, including overseas. In line with the most modern technology of the aeronautical industry, CUBE is made of aluminium, with a very light structure (6,000 kg), which ensures dynamism and speed of execution. 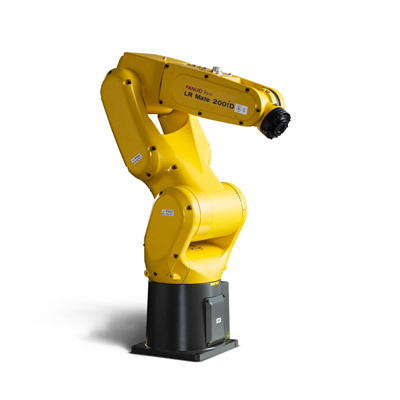 FANUC's control and laser system assembly ensures the total reliability of the Japanese company's solutions, combined with the advantage of timely and qualified global assistance. "Without forgetting that the name FANUC, for a small company like ours, opens doors that would otherwise be rarely accessible, particularly abroad", emphasises Sciarrabone of Applyca. Another peculiarity of CUBE, is its being a laser machine with a modular architecture; in other words, it is possible to combine ad hoc modules with the machine's core to make it a greater size, according to the configuration required by customers. The obvious advantage is to offer the market a "light", non-oversized machine, and versatile in being able to grow with the specific needs of the project. The modules can then be served by automatic loading systems, or robotic cells capable of separating the finished product from the waste. "Some of our customers make crossings for motorways or river bridges and have the need to cut even 30-40 metres long pieces. Others, on the other hand, make circular saw blades for cutting wood. With CUBE, Applyca offers the market a laser machine that is good for small workshops, that works for both small sheets, and for companies used to managing larger pieces". CUBE also allows the Friulian company to enter the eyewear market, historically located in the Belluno area. "Local companies that gravitate around the eyewear world are often small and artisan businesses capable of creating a product of the highest quality. The tendency of the sector is to laser cut temples and frames, so as to obtain design details, and use resistant and light materials such as titanium. Also keeping in mind that this type of processing is often personalised, working small batches". It is therefore clear that such businesses need to equip themselves with a laser machine to remain competitive, without upsetting the budget of the workshops, or occupying vital space during production. The benefits of CUBE are that it offers the maximum versatility, combined with an extremely compact structure. An extra "plus” is given by the presence of FANUC solutions on board, is that of indexing the activities related to speed and cutting quality. CUBE allows to accommodate sheets of 1,500 x 3,000 mm up to 220 kg of weight, the exceeding portion protrudes from the slot of the machine and the operator is able to feed the material on automatic or manual mode. The cutting speed reaches 6 m/min, with a 2 kW FANUC FF2000i-A generator that maintains 2G acceleration during cutting. There are seven models in the fibre laser series offered by FANUC, ranging from 500 W to 6 kW power. The 30/31i-LB type laser controls are particularly suitable for "fly cut" applications. The "L" in the acronym of the control unit, indicates that it is equipped with specific functions for the use of the laser, functions that greatly optimise the effectiveness, intelligence, and quality of processing in laser cutting machine tools. The exterior appearance and user interface are identical to all other FANUC CNC controls. The CN 30i-LB can control up to 32 axles, of which 24 are simultaneous. In the case of 3D laser-processing machines, 5-axle operation can therefore be applied, which is optimal for fibre lasers. The laser connection is not carried out via the I/O Link, but rather via the FANUC Serial Servo Bus (FSSB), at high speed. Since the control manages the movement of the axles and the regulation of the laser power in a synchronous manner, high-quality cutting speeds can be achieved with the FANUC CNC. When the laser, for example, has to cut an angle, the cutting speed and laser power are adjusted simultaneously, resulting in an optimal cutting quality. Turning around the corner at low speed, the laser power will also be reduced. "Flying over the sheet", the laser can be inserted with maximum precision at the exact predetermined point. 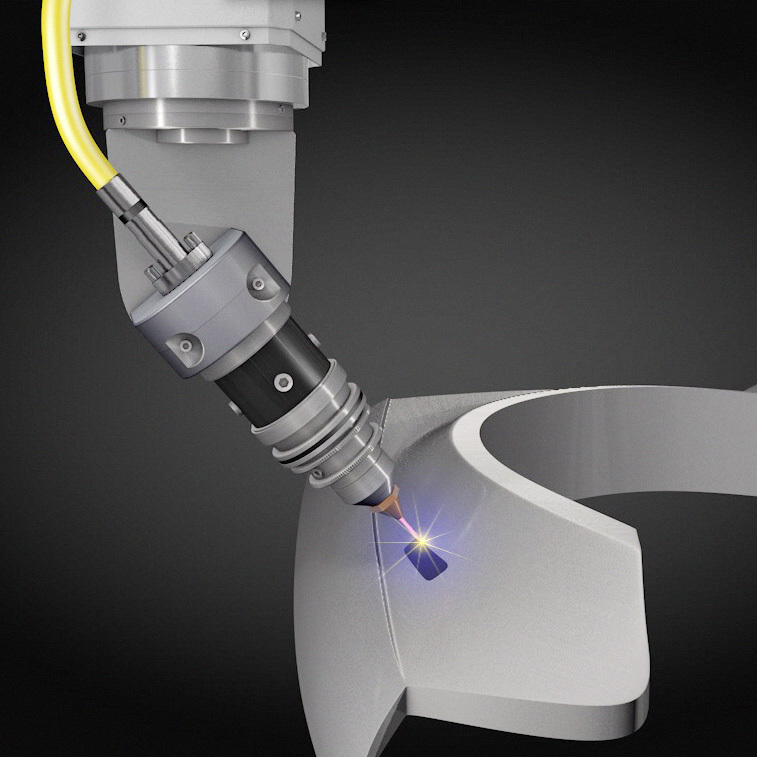 When cutting, the laser will move to the expected point with μ precision. This function called "fly cut", requires that there is a minimum latency between signal and execution. This is possible thanks to the fast connection of the Bus FSSB FANUC. For laser control, the time taken is within a scope of μs. In this manner, high "fly cut" speeds and, at the same time, high positioning accuracy are achieved. The FANUC fibre laser operates at a wavelength of 1,070 μm. This enables thinner sheets to reach considerably higher cutting speeds than with a CO2 laser. Another advantage of the fibre laser is its efficient and low energy consumption.